Michael Jackson Columbian BAD Limited Edition Colombian LP Album With “Todo Mi Amor Eres Tu” Bonus Track This commercial Columbian release of Michael Jackson’s 1987 “BAD” album with catalog# 19433 was issued without the typical gatefold jacket cover. But easily the most unique inclusion on this record is that it includes the bonus track “Todo Mi Amor Eres Tu” (the Spanish version of “I Just Can’t Stop Loving You”) as the first track of Side A. Although the song was released on various limited edition single formats (most notably this Costa Rican 7” record with “BAD Tour rehearsal cover” worth over $1500 and this Columbian promo 7” single on blue vinyl worth about $450), this may have been the only vinyl release of this song on the full length BAD album, making it a very unique collectible. In excellent condition this album is worth around $450. 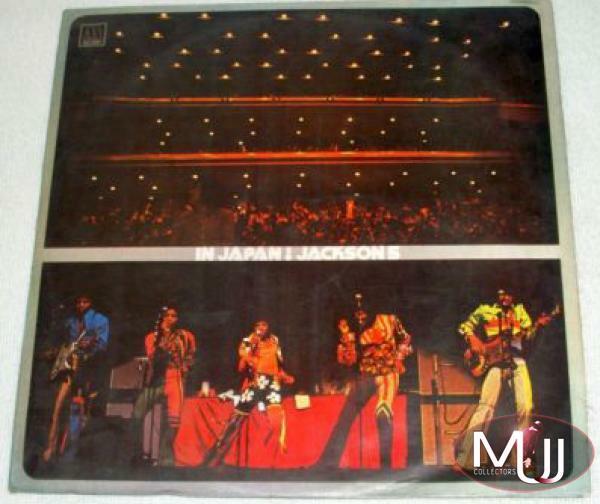 Jackson 5 “In Japan!” Commercial LP Album (Ecuador) This rare commercial release (#29007) from 1975 is on the Fediscos Ecuador label and features a live 1973 Jackson Five concert from Osaka, Japan. Aside from the earlier Japanese album releases, this may have been the only other vinyl release of this concert. In excellent condition, this album is worth about $300. “The Michael Jackson Album” 'Hörzu' Commercial LP (Germany) This rare 1973 German release from Tamla Motown (#SHZE-385) features nineteen solo Motown tracks in a unique “Live” cover of Michael performing with The Jackson Five. In excellent condition, this album is worth about $250. 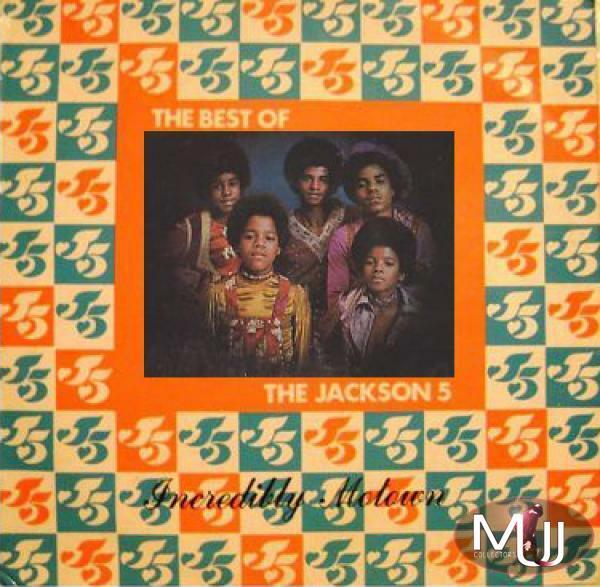 The Best Of Jackson 5 “Incredibly Motown” LP Commercial Album (South Africa) This rare South African album (#TMC-5274) released in 1974 includes 10 Motown era tracks. This album is worth about $250 in excellent condition. 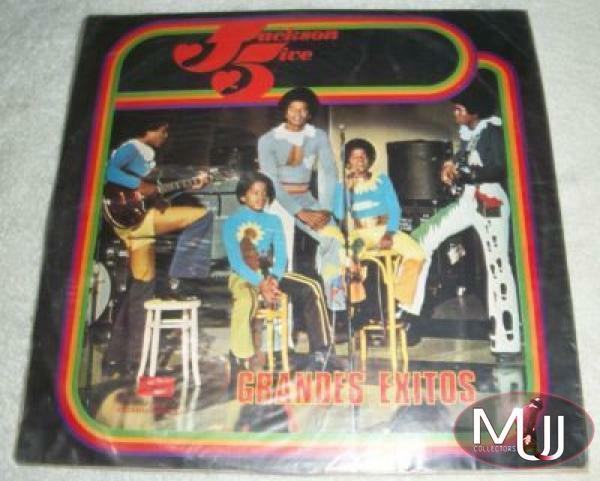 Jackson 5 “Grandes Exitos” Commercial LP Album (Ecuador) This rare 1976 Ecuadorian vinyl album (#12-29020) features a unique cover of the Jackson Five rehearsing from the “Goin’ Back To Indiana” TV special, and is very hard to find. This album in excellent condition is worth about $250. Jackson Five “Anthology” Commercial 2LP Album Set (Italy) This rare Italian edition of the 1976 “Anthology” (#ATMLP 26034) is a two LP set with a special green tinted gatefold jacket. Unlike the more typical 3 album Anthology sets, this one excludes the Jermaine solo cuts, but includes most of the Jackson Five and solo Michael Jackson tracks. On the back cover there is an introduction about the Jackson 5 written by Marco Margiarotti, an Italian music critic. In excellent condition this album is worth around $200. Jackson 5 “Their Twenty Greatest Hits” Commercial LP Album (New Zealand) This rare 1977 release from New Zealand (#AXIS 26) features a unique cover portrait of the Jackson Five and twenty Motown era hits. In excellent condition this album is worth about $200. 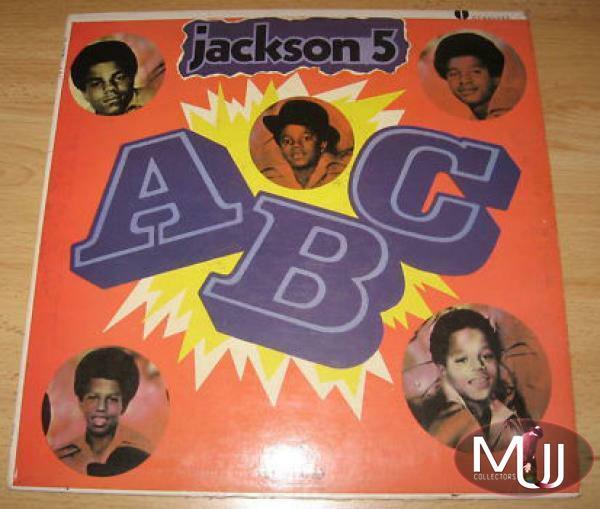 Jackson Five “ABC” Commercial LP Album (Mexico) This original Mexican version of the 1970 release of “ABC” (#STAM-233) sports a very unique cover and is harder to find than most of the more typical releases from the early Jackson Five era. This album in excellent condition is worth about $180. 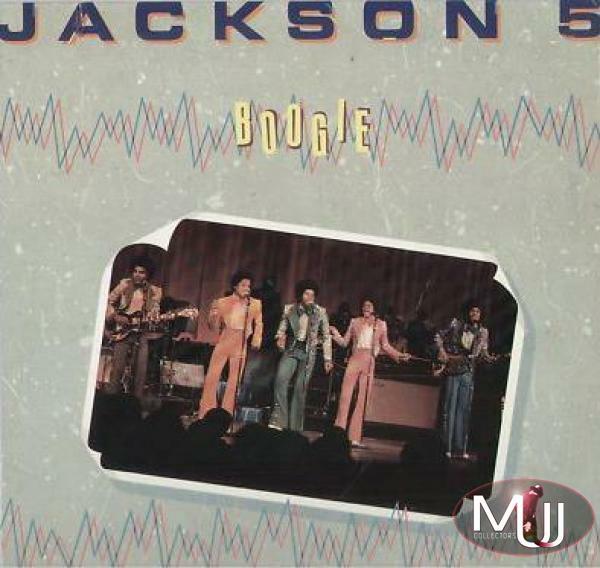 Jackson 5 “Boogie" Commercial LP Album *Natural Resources* (USA) This 1979 vinyl LP (#NR-4013T1) released by Motown’s sister label Natural Resources was withdrawn shortly after release so remains very rare and hard to find. Many of the album’s ten tracks were at the time unreleased. Unique “live performance” cover image, with track list on back. This album in excellent condition is worth about $150. 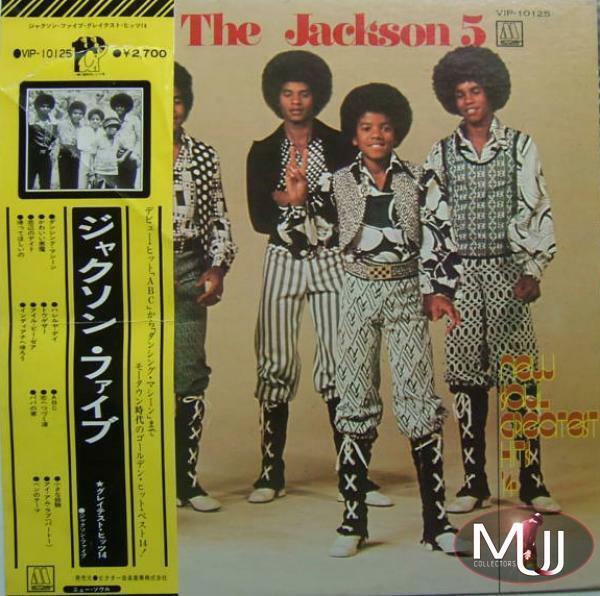 The Jackson Five “Diana Ross Presents The Jackson 5” Commercial LP Album (1969) (Japan) Perhaps the most valuable of all the original Jackson Five Japanese releases, the first printing of this record (#FL-2011) in excellent condition is worth over $400. The second printing of this album, (#SJET-8234) issued in 1970 with a green OBI strip, is worth around $200. 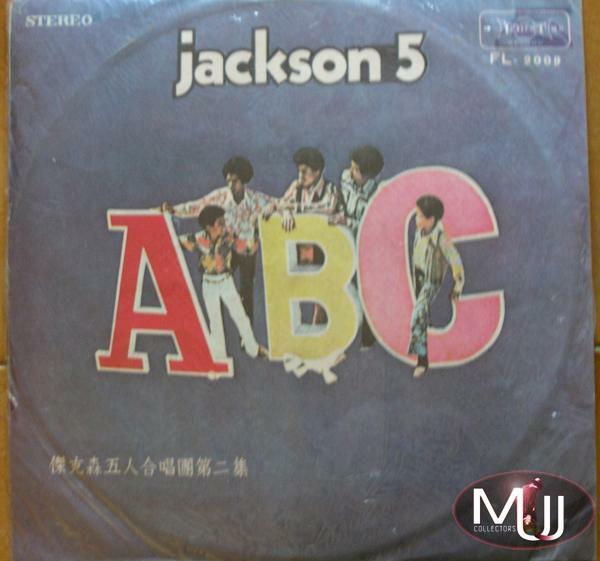 The Jackson Five “ABC” Commercial LP Album (1st Printing) (Japan) The second Jackson Five album, "ABC", is worth about $400 for a first printing original (#FL 3009). The second printing of the LP (#LM 2353), released a year later in 1971, is worth around $250 in excellent condition. 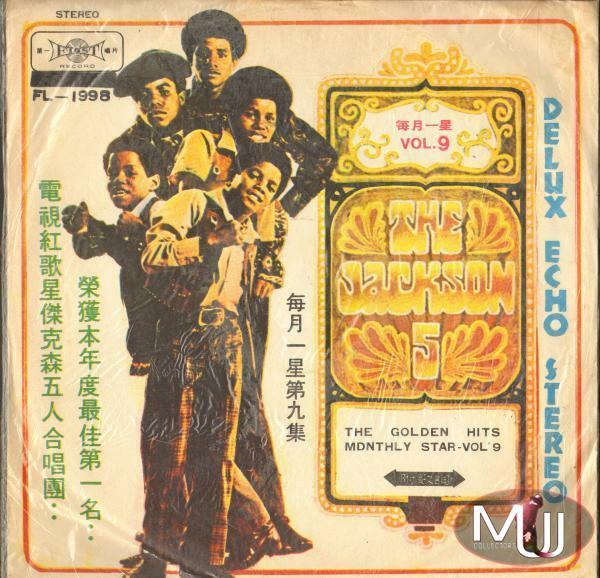 “The Golden Hits By The Jackson Five” Commercial LP Album *First Records* (Japan) This c. 1971 “Vol. 9” (#FL-1998) release on Japan’s First Records includes eleven hits by The Jackson 5. The jacket is a picture of the "Diana Ross Presents" album cover. This album in excellent condition is worth over $400. 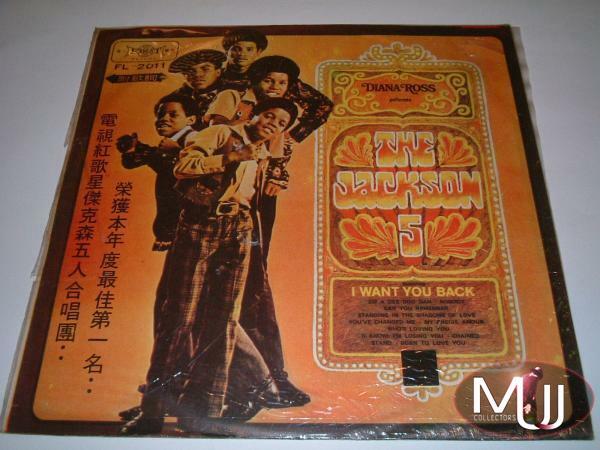 Jackson Five “New Soul Greatest Hits 14” Commercial LP Album (Japan) This rare Japanese compilation issued in 1976 (#VIP 10125) contains 14 Motown era hits. 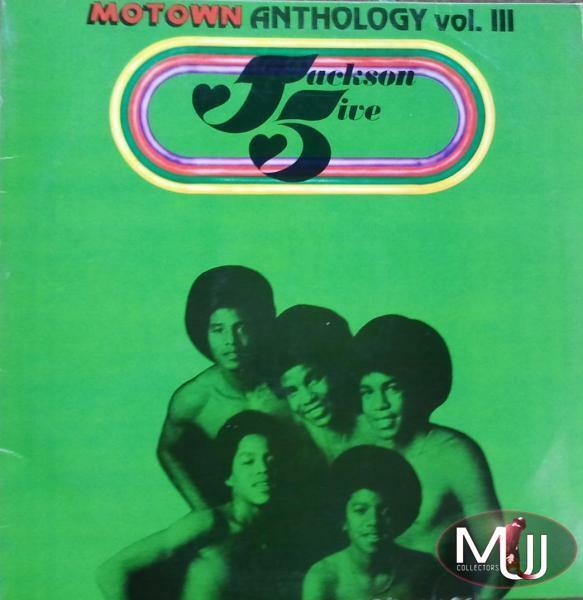 Originally issued with a unique Jackson Five group portrait cover with OBI. In excellent condition, this album is worth about $300. 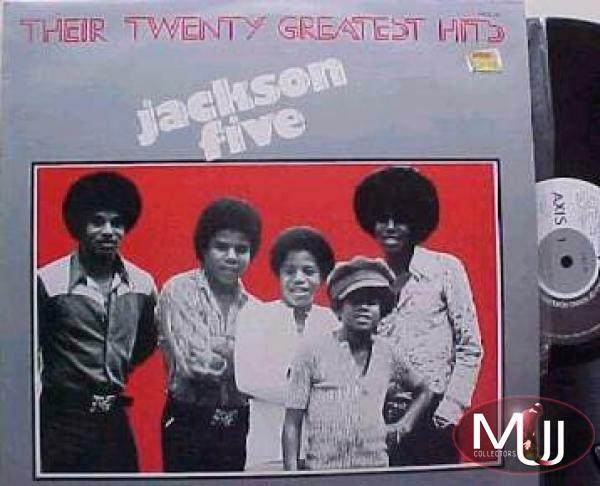 Jackson 5 “Greatest Hits 24” Double Commercial LP Album Set (1st Printing) (Japan) This double album vinyl set (#SWX 9013 14) features 24 Motown era tracks from the Jackson Five and Michael Jackson solo. 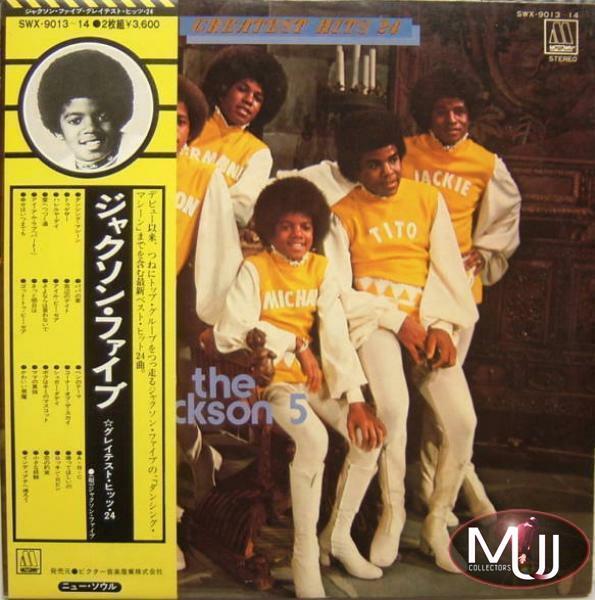 Originally issued with a unique Jackson Five group portrait with “named” yellow outfits, with OBI. This album in excellent condition is worth about $250. Additionally, there were two very rare “Quadraphonic” Japanese vinyl releases, this 1975 Greatest Hits album (#CD4W-7090), worth about $500, and this live “In Japan!” album (#CD4W 7037) from 1973, worth about $300. 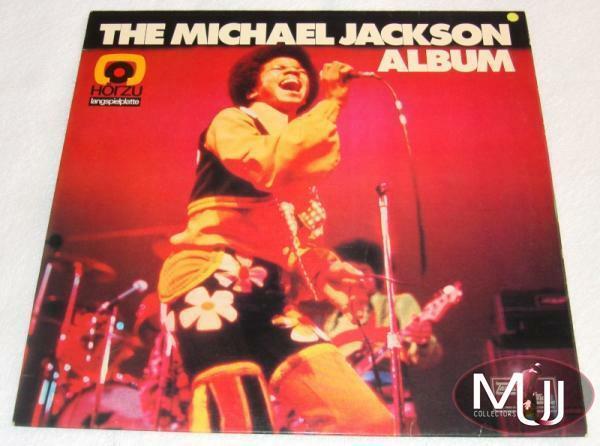 Visit the Commercial Albums section of our Memorabilia Showcase for a complete list of all Michael Jackson commercial albums. During the Dangerous era in 1992, three ultra-rare Michael Jackson Brazilian promo vinyl record albums were released: “The Love Songs”, “The Medleys”, and “The Mega Remixes”. Together these records could very well be the “Holy Trinity” of promotional albums, since each is worth several hundreds of dollars, especially if in excellent or mint condition. They range in value from $500-700 each, but at times can sell for double or even triple those amounts! Each of them were also promotionally issued on compact disc, and these CDs are also extremely rare and valuable. Michael Jackson “The Mega Remixes” Promo LP Album (Brazil) In 1992, Epic released the first of these three Michael Jackson promo albums, “The Mega Remixes” a ten track promotional record with catalog# 51.607. This was sent to select radio stations in Brazil and included remixed tracks from each of Michael Jackson’s four Epic solo albums: Off The Wall, Thriller, BAD, and Dangerous. The picture cover shows Michael from the Jam video. In excellent condition, it is worth about $500. Michael Jackson “The Love Songs” Promo LP Album (Brazil) Concurrently with the 1992 “Mega Remixes”, Epic released the second of these promo albums, “The Love Songs”. 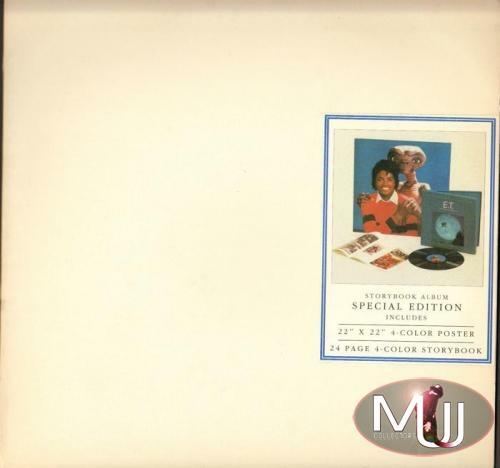 This Brazilian eight track LP record with catalog #51.608 was housed in a unique picture cover with Michael and Naomi Campbell in a still image from the "In The Closet" video. In excellent condition, it is worth about $600. 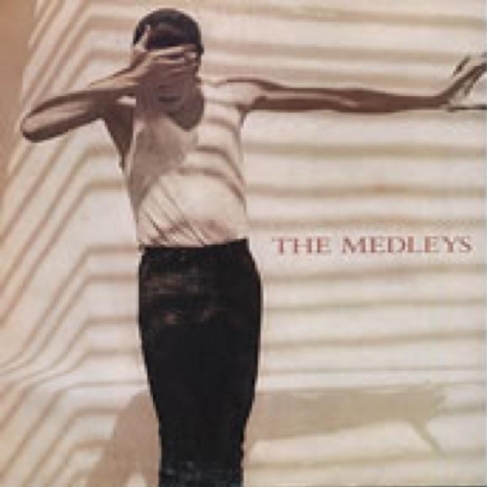 Michael Jackson “The Medleys” Promo 2 Track LP Album (Brazil) During late 1992, Epic released the third and final of the Michael Jackson Brazilian promo albums, called “The Medleys”. This two track Epic release with catalog# 52.243 featured two long form tracks including “The Back To The Past Medley” with “Rock With You”, “Off The Wall”, and “Thriller”, and “The Dangerous New Jack Medley” with “Remember The Time”, “Jam”, and “Black Or White”. 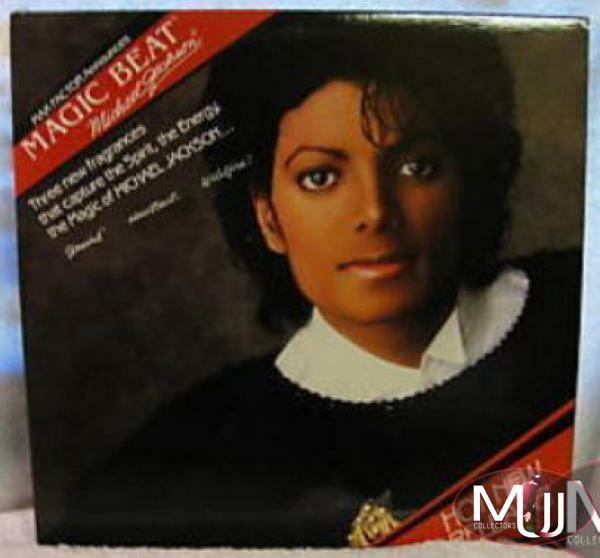 It was issued with a unique picture sleeve featuring Michael from the “In The Closet” video. This is the most valuable of the three Michael Jackson Brazilian promo albums, as one in excellent condition is worth about $700. 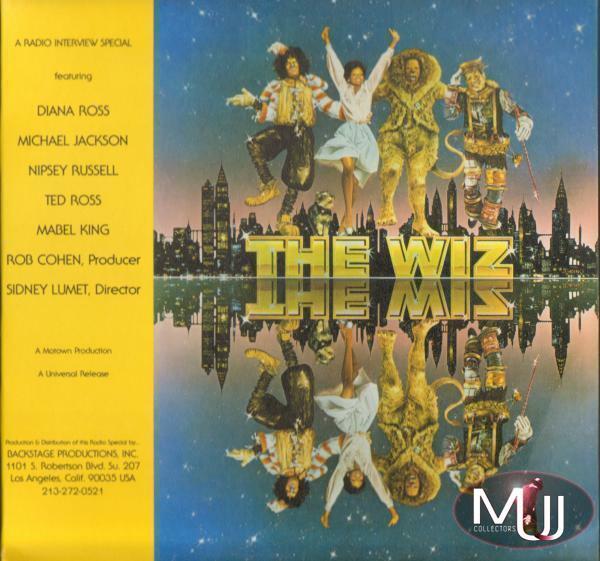 A Very Special Musical Interview Feature With The Stars Of "The Wiz" Radio Broadcast Album 2 LP Set (USA) This extremely rare promotional broadcast record set was sent to a handful of USA radio stations in 1978. It includes an exclusive interview with Michael Jackson (and music from the movie including “You Can’t Win” and “Ease On Down The Road”). But perhaps most unique about this release is that it is housed in two beautiful picture covers with the original artwork from the movie. Radio broadcast records almost never have picture covers, because they are not meant for commercial usage (generally, these broadcast records had generic title sleeves, if any, because the records were usually thrown away after the broadcast was aired). Although this record may not be as in demand as a record such as the withdrawn Dutch Smile 12”, it is no doubt much rarer, and likely this is due to fewer collectors knowing about this rare treasure. In excellent condition (both records and both jackets), this record set is worth about $1000. 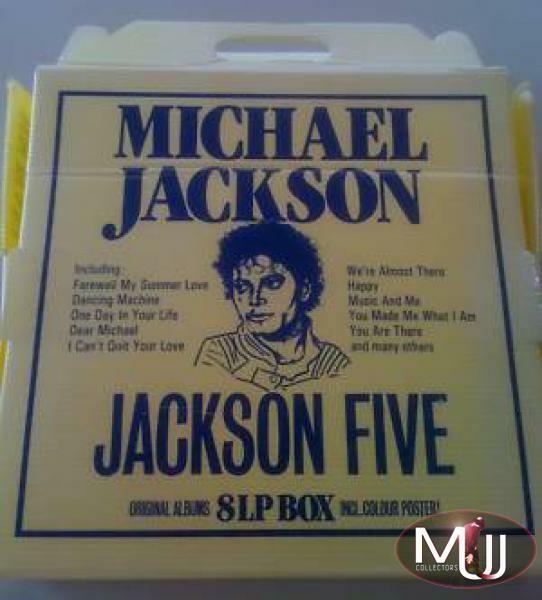 Spotlight Specials: Michael Jackson (1/15/84) Radio Broadcast Album Box Set (USA) This radio broadcast box set originally aired on 1/15/84 and was released by ABC Watermark. 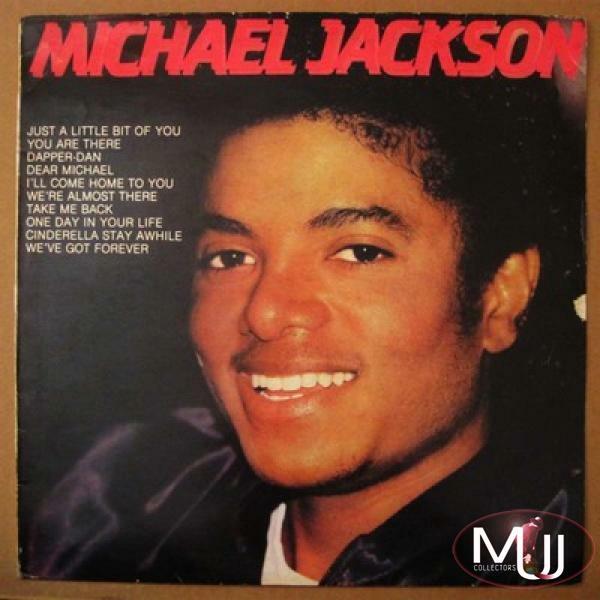 The double album set is comprised of extensive Michael Jackson interview segments and includes eighteen songs from “I Want You Back” up through and including the hits from Thriller. It also includes interview segments with Marlon, Randy, Jermaine, Quincy Jones, Smokey Robinson, and opens with an excerpt of Don King at the Victory Tour Press Conference from Tavern On The Green in New York. Comes with a 7 page cue sheet booklet in deluxe white box set. This box set in excellent condition is worth about $275. Hot Rocks: “The Michael Jackson Story” (USP) Radio Broadcast Album *2 LP Set* (USA) This 2 LP set issued by United Stations Programming Network originally aired on 10/31/87. 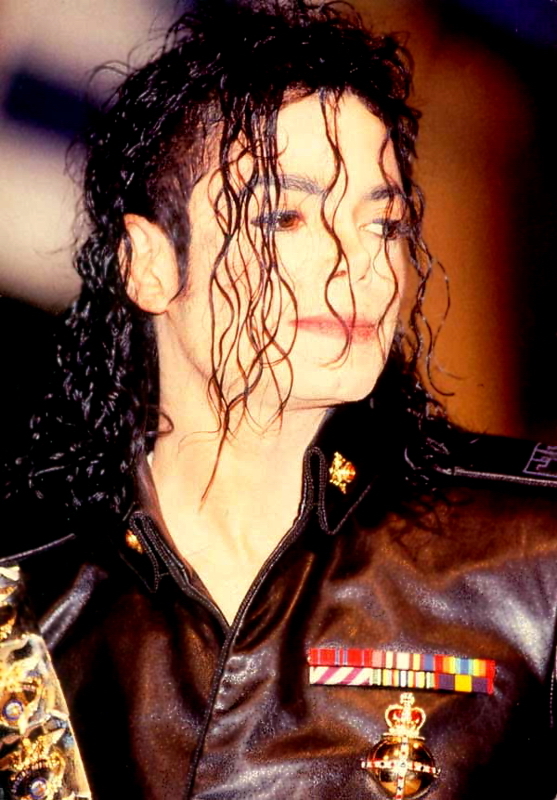 The broadcast records are entirely devoted to Michael Jackson and include fifteen complete songs (primarily taken from Off The Wall, Thriller, and BAD) and numerous interview segments, hosted by Steve O’Brien. This record set in excellent condition is worth about $250. 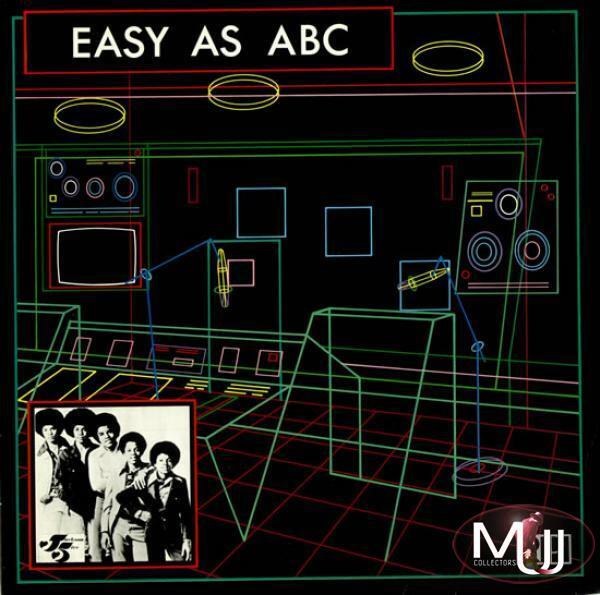 The Jackson Five: "Easy As ABC" BBC Radio Broadcast Album 1986 (UK) This radio broadcast record from the UK’s BBC Radioplay (#TAIR85050) was released in 1986 and includes 12 tracks from the Motown era including eleven songs by the Jackson Five, and Michael’s solo debut “Got To Be There”. This record in excellent condition is worth about $220. Budweiser Concert Of The Month (The Jacksons) Radio Broadcast Album (USA) This broadcast album issued through Westwood One (#BC-82-15) was aired on 7/23-7/25/82. 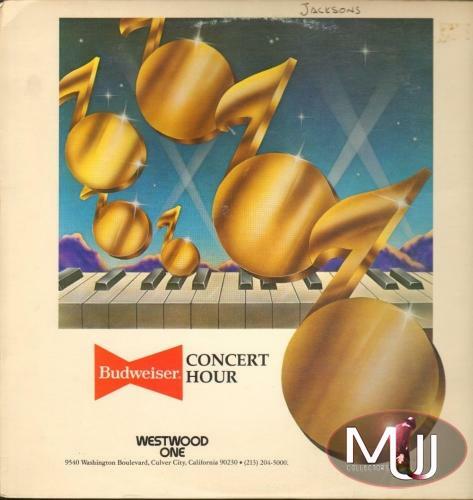 It features selections taken from the "Jacksons Live" 2 LP set and comes in a "Budweiser Concert Hour" cover with cue sheet. This album in excellent condition is worth about $200. 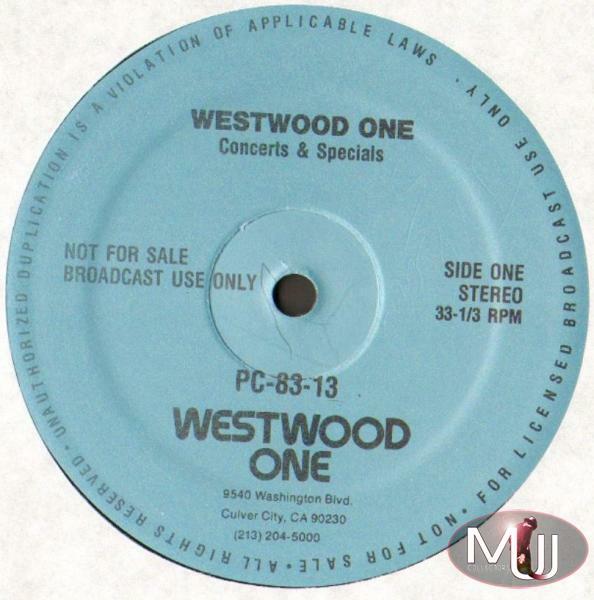 Westwood One Concerts And Specials (The Jacksons) Radio Broadcast Album *2LP Set* (USA) This radio broadcast two album set was released by Westwood One (#PC-83-13) with a July, 1983 airdate. It appears to be the exact content as the 2LP "Jacksons Live" commercial release. Comes without a jacket cover. This album set in excellent condition is worth about $200. Michael Jackson: “The E.T. Storybook” Radio Broadcast Album (USA) This special "DJ" version of the E.T. Storybook album comes in a white jacket with a "Michael and E.T." sticker on the front. MCA Records sent this to select USA radio stations in November, 1982 prior to the cancellation of the commercial release. This promo album comes with the same record, poster, and storybook as the commercial version, with the same catalog # (70000). In excellent condition, the album is worth about $180. 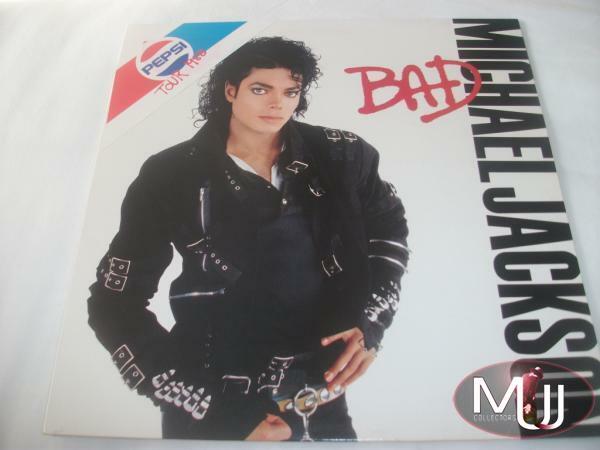 Michael Jackson BAD Tour '88 Promo Pepsi LP Album (Sweden) Extremely rare promotional BAD LP album (#EPC 4502901) pressed in Holland for Swedish Pepsi bottlers. Special jacket reads “Pepsi Tour 1988” and comes with a four page insert detailing the Jackson/Pepsi media Summer campaign and promo offerings. This album with original inserts is worth over $1000. 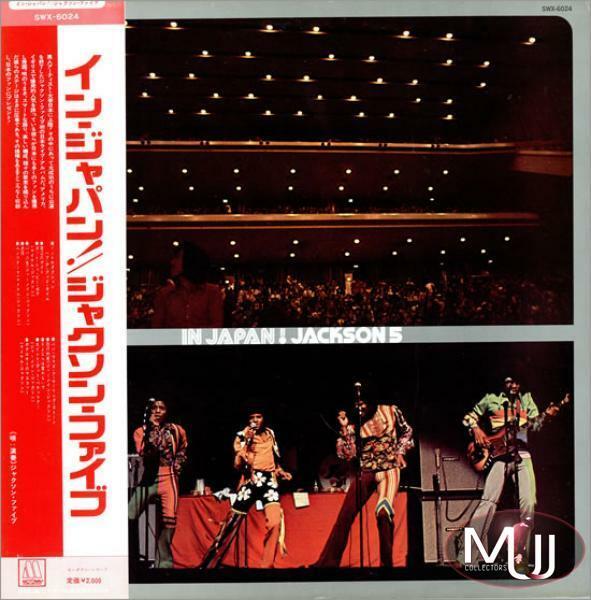 The Jackson 5 “In Japan!” Promotional Album (Japan) This 1973 Japanese promotional album (#SWX 6024) was recorded live in Osaka in April, 1973 during the Jackson 5 Tour in Japan. It is particularly unusual because the promo version contained some misspelled track titles, later corrected in the commercial version. In excellent condition, this album is worth $550. Michael Jackson BAD Tour '88 Pepsi Promo Press Kit W/ BAD LP Album (Italy) This BAD album was issued as part of a rare press kit in conjunction with Michael Jackson’s 1988 BAD Tour in Italy. The album itself is stamped “free sample –not for sale” (in Italian) on the back of the cover. It also includes a BAD CD, with the same stamp on the back side of the booklet. Additionally the kit includes separate cartoon displays of three Michael Jackson solo Albums: Off The Wall, Thriller and BAD, and a 4 page inlay sheet telling the history of Pepsi-Cola in English with Michael’s bio and info on the BAD Tour. Only a few of these were made, so this complete kit in excellent condition is worth $300. 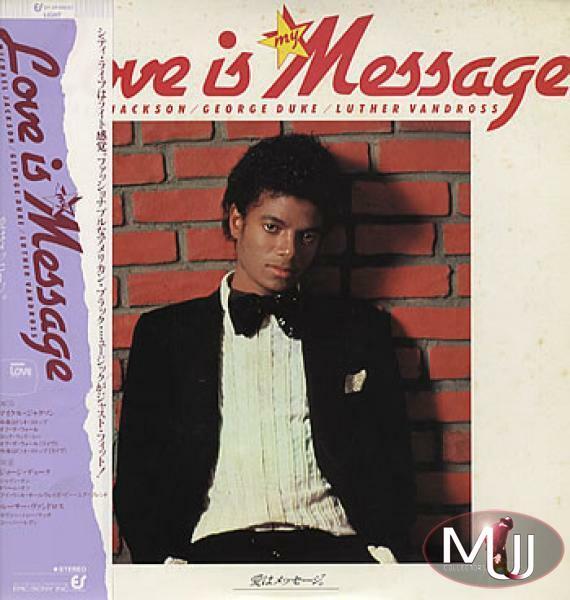 Michael Jackson “Love Is My Message” Promotional 10 Track LP Album (Japan) This rare 1982 Japanese Promotional 10 track LP (#QY-3P-90047), was part of the “Love Is My Message” 1979-82 Suzuki ad campaign. 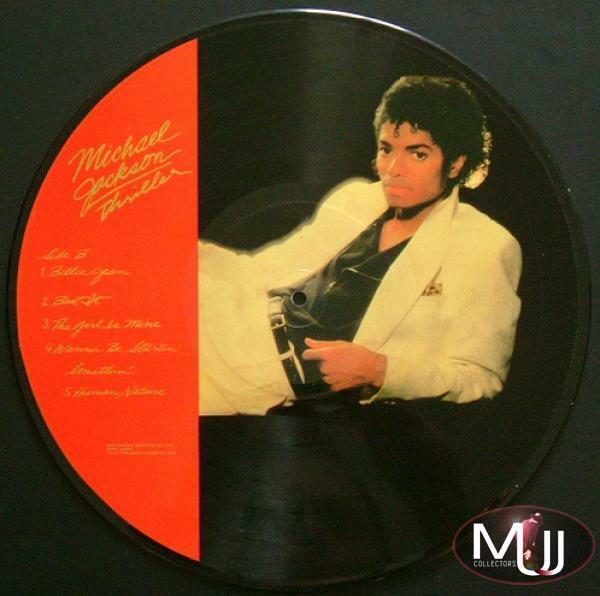 Features Michael in a tuxedo on the cover, with five tracks on the A side taken from “Off The Wall” and “The Jacksons Live”. Side B includes tracks from George Duke and Luther Vandross. Comes with Obi strip with Japanese text. This record is worth about $130 in excellent condition. Visit the Promotional Albums section of our Memorabilia Showcase for a complete list of all Michael Jackson promo albums. 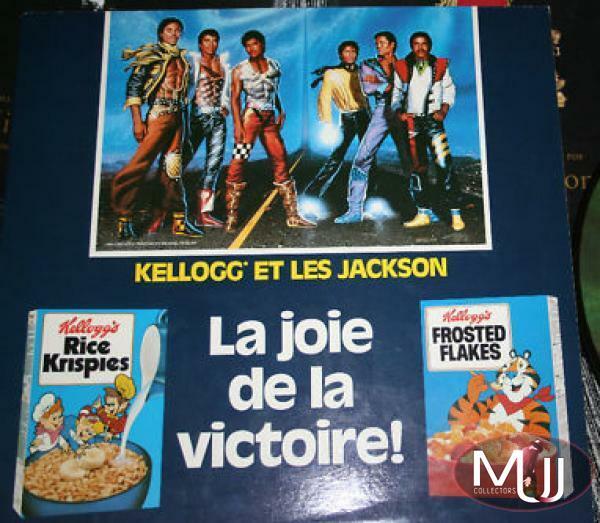 The Jacksons: “Kellogg's Et Les Jackson 'La Joie De La Victoire! '” Picture Disk (Canada) This ultra-rare French Canadian release (#PAL-38946 / PBL-38946) comes in a special gatefold jacket issued in conjunction with a February, 1985 retail promotion by Kellogg’s following the Jacksons’ Victory Tour. Although the Victory picture disk itself (and the stickers with sticker book) appear to be the same as the standard release, these promotional packets are rare as they were sent to retailers in the USA and Canada to announce the details of the promotion, which included sets of stickers inside cereal boxes and various mail order items. The promotion was called “The Taste Of Victory” in the USA and Canada, but a very small number of the jackets (very likely less than 100) were printed in French (“Joie De La Victoire”) for the French Canadian market, making it a very rare collectors item worth over $1800. By comparison, the English Canadian version (8E8-39576), produced in 500 copies, is worth about $500 and the more common USA version (#PBL-38946/SAI-2561), produced in quantities of 5000, is worth about $100. The easiest way to tell the difference between the English Canadian and USA versions is that the Canadian versions (both in English and French) include Rice Krispies and Frosted Flakes on the jacket whereas the USA version includes Corn Flakes and Froot Loops. Michael Jackson “Dangerous” Promo Picture Disk (Brazil) This Brazilian test pressing picture disk (#144775) was pressed in very small quantities in advance of the album’s release, but it was scrapped when Sony learned that Dangerous was going to be a double album set. The story goes that only 26 test pressings were pressed and distributed to Sony executives. However, the commercial release was scrapped because doing a “double picture disk” release would further delay the release of the album, so Sony requested all 26 copies to be destroyed. However, an unknown quantity were never returned (fanzine “Back & White” #3 suggested that there were only 12 still in existence worldwide). Since the disc was pressed prior to the completion of the album, Sony used Richard Clayderman piano tracks taken from his Christmas album for the music. The front and back artwork is the same. Unlike the USA “display only” disk, this one has a clear rim and matrix numbers of XSLP-970 & XSLP-971. Because of the rarity of this item, it is valued at more than $1500 in excellent condition. Michael Jackson “HIStory Past, Present And Future Book I” Promo Picture Disk (Brazil) This ultra rare promotional Brazilian picture disk (#177.449) was made as a test pressing with only 200 made. 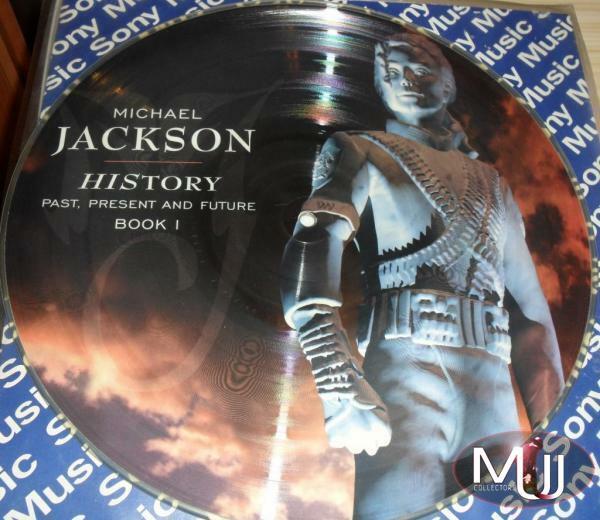 Since HIStory was to be a 3 LP vinyl release, an official picture disk of the album was never produced. This test pressing includes an A side (album cover artwork) with “D.S.”, “Money”, “Come Together”, “You Are Not Alone”, and “Childhood.” The B side (“on toes” pose) includes “2BAD”, “HIStory”, “Little Susie”, “Smile”, and “Tabloid Junkie.” In excellent condition, this picture disk is worth about $1000. A “display only” version of this disk was also produced (without grooves) and is worth about $300. Michael Jackson/Max Factor "Magic Beat" Promo Picture Disc (USA) This promotional kit from Max Factor was issued in 1986 to promote the “Magic Beat” line of Michel Jackson perfume. Due to the delay of the BAD album, the line was quickly pulled soon after it hit shelves. This particular kit included the “Thriller” USA picture disk, but as with the “Taste Of Victory” release, the packaging included is actually worth much more than the picture disk by itself. This kit includes a deluxe gatefold jacket with unique artwork, an 8”x10” photo, a letter from Max Factor, two glossy color slicks on the perfume and the Thriller album, and several inserts (including on the inner jacket cover) with pictures and descriptions of each perfume fragrance. The picture disk is apparently thicker than the normal USA picture disk (and is marked “Promo Ownership Reserved By CBS”), although it appears to be identical to the commercial issue, with the same custom sticker. An interesting side note is that the back of the jacket mentions planned in-store appearances by Michael Jackson to help promote the perfume. This kit, with complete contents, is worth about $1000. 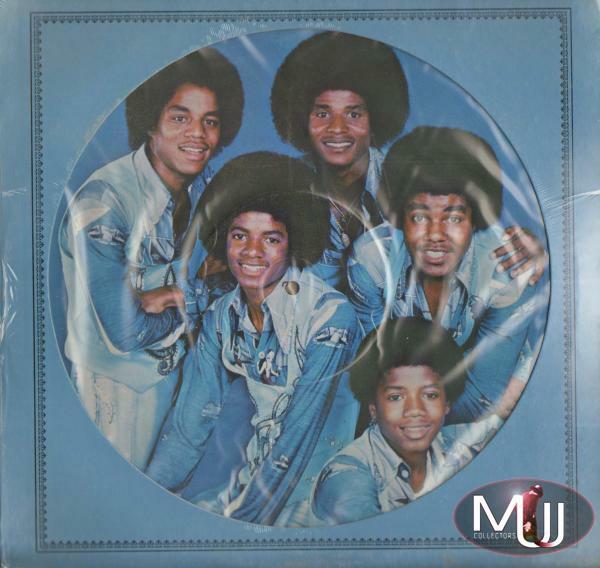 The Jacksons 1976 "The Jacksons" Blue Vinyl Picture Disk (USA) This very rare blue vinyl picture disk features a unique color picture of The Jacksons in blue stage outfits (with the same picture on both sides) taken during a 1976 photoshoot for their CBS TV series. It originally came with a custom blue jacket with an open view front and the track listing on the back. There is no catalog number on the record or jacket, but it is commonly known as #PE-34229, which is the same catalog for the standard issue. This picture disk is worth about $600 in excellent condition (and even more if still with the original jacket). The Jacksons "Goin' Places " *Teen Night* Picture Disk (USA) Very rare promotional picture disk of the "Goin' Places" album that was to be sold at a planned May 13th, 1978 Jacksons concert at Dodgers Stadium in Los Angeles that was later cancelled. 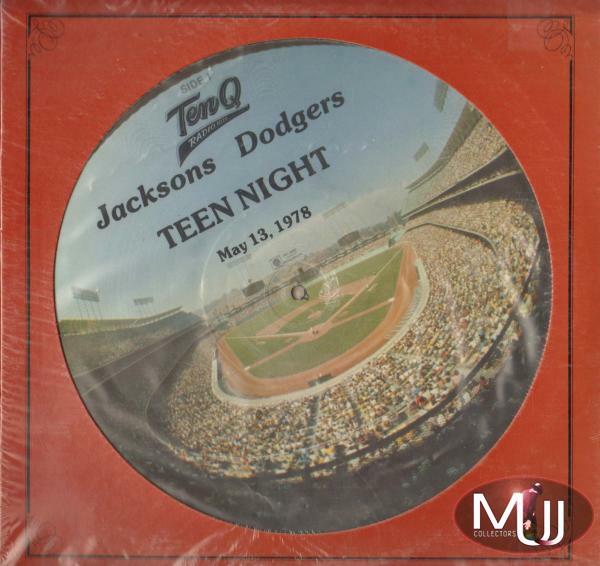 The front reads: "Ten Q Radio 1020-Jacksons Dodgers Teen Night: May 13, 1978" with a picture of Dodgers Stadium. The back has the LP cover with The Jacksons in aviator outfits. Comes in a special custom red jacket with track listing on back. There is no catalog number on the record, although it is commonly known as #34835-1G which is the catalog# for the Goin' Places album. This picture disk is worth about $500 with the jacket in excellent condition. 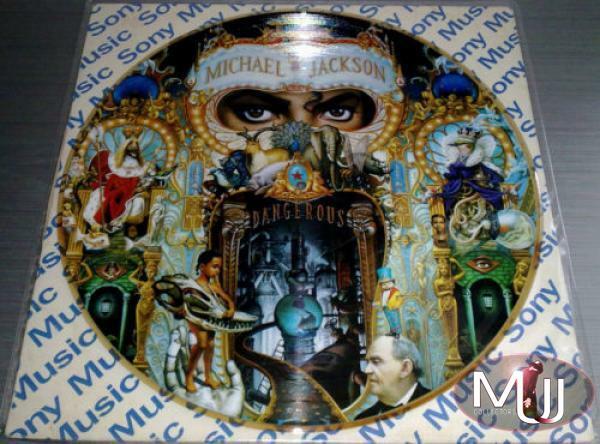 Michael Jackson "Dangerous" Display Promo Picture Disk (USA) This is a "display only" picture disc that was sent to select USA record stores to display on their walls during the 1991 Dangerous promotion. There is no music on this disk (and no grooves in the vinyl). The disk has the same "LP cover" picture on both sides and there is a small hole at the top where a tack or nail would have gone to mount the disc to the wall. This picture disk is worth about $400. Michael Jackson “Thriller” Test Pressing Picture Disk (Taiwan) This very rare Taiwanese 1982 test pressing of “Thriller” (#0154) includes five tracks from the album (on Side B) and songs from the “Flashdance” soundtrack on the A Side. This picture disc is worth about $400. 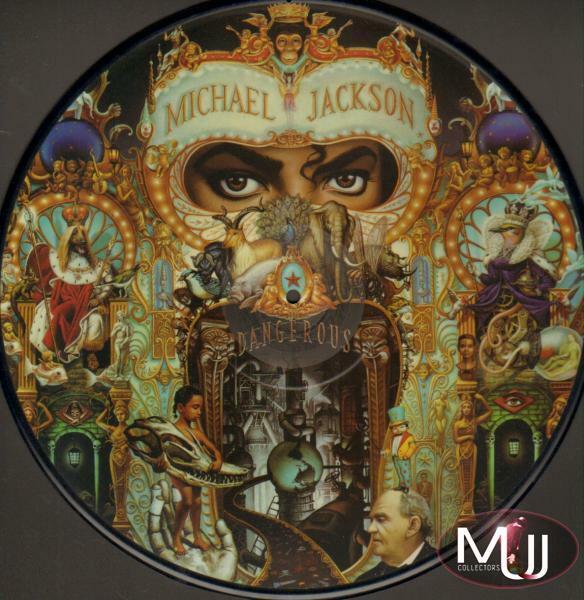 Visit the Picture Disks section of our Memorabilia Showcase for a complete list of all Michael Jackson picture disk albums. 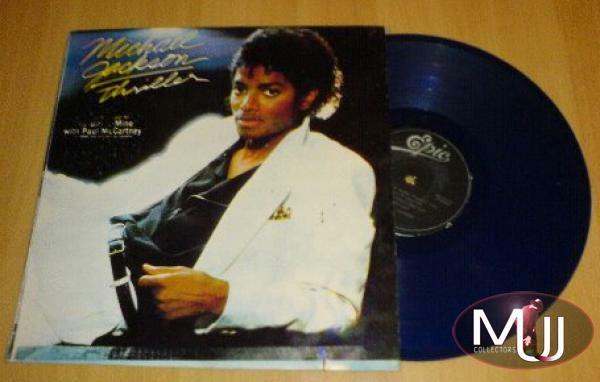 Michael Jackson “Thriller” Limited Blue Vinyl LP Edition (Nigeria) Quite possibly the rarest Michael Jackson album in existence, with perhaps no more than a dozen ever made (#DNW 2819). Not as sought after since few collectors even know of its existence, but this record in excellent condition could be worth as much as $2500-$3000 (or more)! 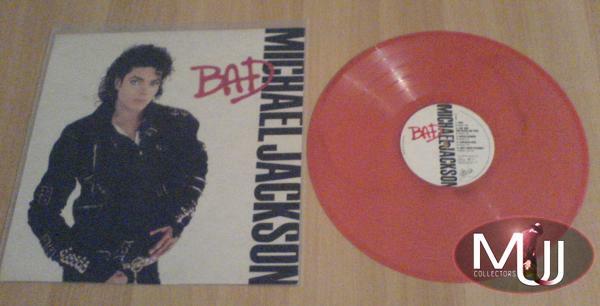 Michael Jackson “BAD” Limited Red Vinyl Album Edition (South Africa) This extremely rare red vinyl edition of the BAD Album issued in South Africa (RSA) is worth over $1500 in excellent condition. As with the Thriller blue vinyl above, these albums were pressed in very small numbers, hence the high value. Michael Jackson “Thriller” Limited Edition LP White Vinyl (Ecuador) Extremely rare white vinyl LP from Ecuador (#333-0049). Non gatefold picture cover with alternate version including a CBS logo and unique design on back side. Track listing in both English and Spanish on labels and cover. This record in excellent condition is worth $650. The Jackson 5 “Maybe Tomorrow” Limited Edition LP Album Orange Vinyl (France) This rare 1971 original French edition of the J5’s “Maybe Tomorrow” with catalog# 2C 062-92403 is worth $600 in excellent condition. Comes in original jacket with custom sticker on front. 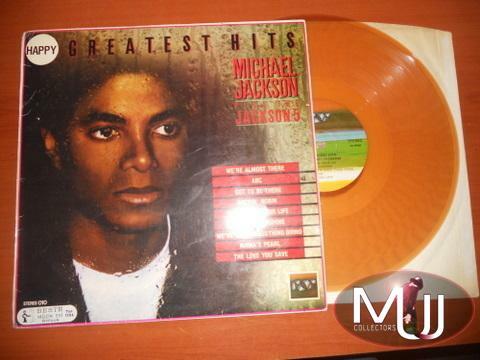 Michael Jackson Plus The Jackson 5 “Happy Greatest Hits” Limited Edition Orange Vinyl LP Album (Turkey) This 1983 Turkish album was pressed on orange vinyl with catalog# AA.010. In excellent condition, this record is worth about $300. ”Michael Jackson” Yellow Vinyl LP Album Edition (Turkey) This simply titled 1983 Turkish compilation album was pressed on yellow vinyl with catalog# CS 132. In excellent condition, this record is worth about $250. 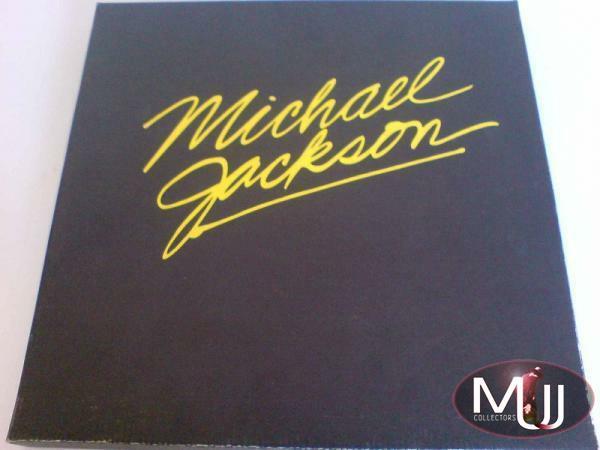 Michael Jackson Special Limited Club Edition 3LP Box Set (Sweden) This official Swedish “Special Club Edition” box set was released in 1988 by a Swedish book company for a very limited number of copies only. It includes Off The Wall, Thriller and BAD vinyl LPs plus a 1984 “Look Book” by Anabas. With a very unique “BAD Tour Live” cover, this box set is worth about $450. 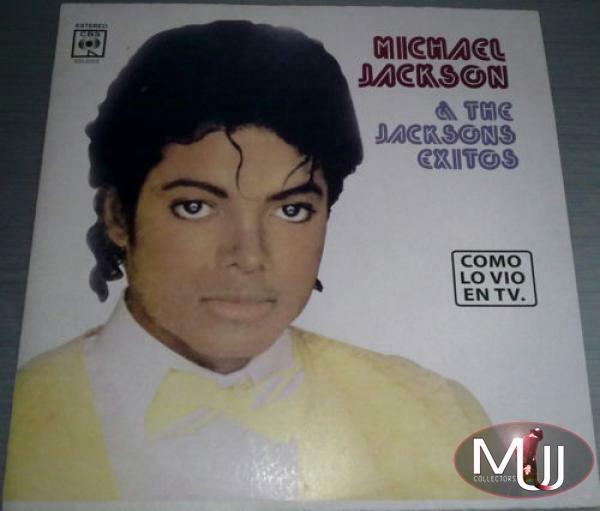 Michael Jackson & The Jacksons "Exitos" Limited LP Album (Ecuador) This 1984 limited edition release (#933-0003) from CBS - Ecuador was a special TV mail order offer. Includes ten Epic era tracks from the Jacksons, Off The Wall, and Thriller. In excellent condition, this album is worth $350. Michael Jackson Promo Club 3LP Box Set (Sweden) This promo Swedish club box issued by Epic in 1983 contains three Michael Jackson LPs: Triumph (The Jacksons), Off The Wall, and Thriller. It also includes a booklet with bio and info on each of the albums. In excellent condition, this box set is worth $350. Michael Jackson "E.T. The Extra Terrestrial Storybook" Limited Edition LP Album (Korea) This rare Korean version of the ET Storybook (#DAS-0072) was released 2/1/83 on the Dae Seong Record label. It features exclusive and unique artwork on the record jacket (front and back). 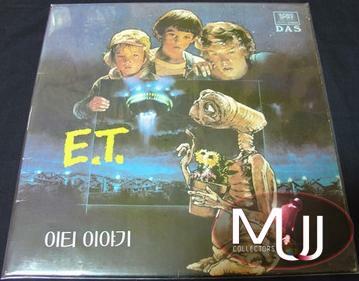 Unlike the other versions of the ET Storybook release, the Korean version did not come in a box set, and did not include the booklet and poster. This album is worth about $300 in excellent condition. Michael Jackson “E.T. The Extra Terrestrial Storybook Album” Special Vinyl Box Set (Japan) This Japanese edition of the withdrawn box set of the ET Storybook Album (#VIM-1) comes with OBI strip, the original vinyl record, a unique 8 page booklet with tests and info (in Japanese), a 24 page color booklet featuring stills from the film, script excerpts, lyrics and credits, plus a fold-out large glossy poster with Michael and E.T. In excellent condition, this box set is worth about $250. Michael Jackson: “HIStory: Past, Present, & Future--Book I” Commercial 3LP Album Box Set Edition (USA) This original USA box set comes with the History album (E3 59000 S1) on three double sided vinyl records with 52 page booklet. With complete contents, this box set is worth about $230. Michael Jackson/Jackson Five “Original Album 8LP Limited Box Set” With Color Poster (USA) This 1985 Motown release (#MJ1) includes eight vinyl LPs: Joyful Jukebox Music, Music & Me, Forever Michael, Moving Violation, Dancing Machine, Skywriter, Farewell My Summer Love, and Get It Together. The box set came in a plastic case “pizza box” with carrying handle, and included a “Farewell My Summer Love” color poster. The cover included an unusual choice of a “Thriller Video” caricature on the front (probably to capitalize on Michael’s Thriller era popularity). This box set was released in at least three different “8LP” versions and at least two different “7LP” versions (such as this one), each featuring an entirely different selection of albums. This particular 8LP box set in excellent/still sealed condition is worth about $180. 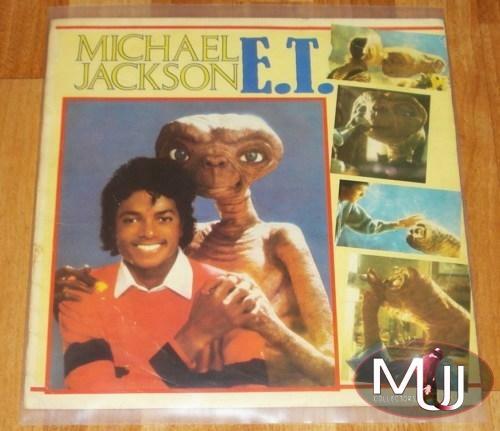 Michael Jackson “E.T.” Limited Edition Commercial LP Album (Turkey) This unique Turkish version of the “E.T. 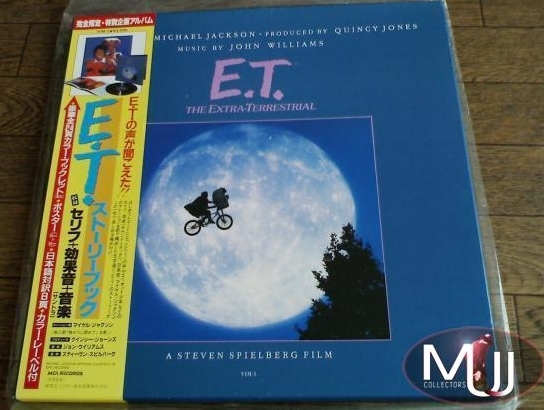 Storybook Album” comes with a custom jacket featuring a large portrait of Michael Jackson with “E.T.” (The “Extra-Terrestrial”) and various stills from the movie on the front and back. Released by Teleskop (#LP-CA12) in 1982, this album does not come with the poster and booklet that was included in the USA version of the Storybook. This album in excellent condition is worth about $150. Visit our Michael Jackson Albums Showcase for more Limited Edition Albums and Picture Disks. Also be sure to read our extensive articles on the Rarest 12" Singles and Rarest 7" Singles!